First, I'd like to welcome author and 4E game designer Rob Heinsoo to the blogroll on the right. Rob promises more entries if I add him, so I'm going to hold him to this. Also, I've been spending a lot of time with Steambirds, a brilliant little game by Andy Moore and Daniel Cook that evokes everything I like about Crimson Skies. The central conceit, that there is a more powerful engine available for flight, allowing heavily armored planes, fits nicely with the game itself. The interface is simple and the rules capture the basics of dogfighting while the alternate universe setting allows for non-standard weapons and attacks. Finally, I've mentioned before that I've been listening to a lot of lectures on tape from the Teaching Company. One of them I enjoyed was on Lost Christianities, by Bart Ehrman, who is also the author of "Misquoting Jesus". Here's the first part of lecture by him that captures the gist of his larger lectures, and well worth listening to. You can follow the other sections on YouTube. This a personal blog that rambles a bit. Have something to say? Get in contact with me here! Law and Sausages by Weiner et. al. 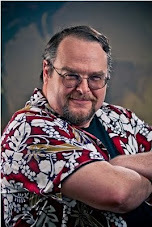 Jeff Grubb is an award-winning author, game designer, and world-builder with a host of credits. He is much calmer in real life. He can be reached here!